Since long ago this land has been attracting people with its beauties: The Yew and Boxwood Grove, majestic mountains, sparkling waterfalls, pith oaks and, of course, the sea - it is impossible to remain indifferent to such nature. Ancient Greeks, and Romans, Byzantines and Genoese, and Turks settled here not by coincidence. From the Genoese there are fortress ruins with four towers. The Byzantines constructed three churches, destroyed later by Turks. Ancient Khosta saw many changes for two and a half thousand years … The end of the 19th century and the beginning of the 20th century was a time of intensive development of the Black Sea coast. That's how the birth of the resort settlement was described in F. P. Dobrokhotova's book, “Black Sea Coast of the Caucasus” published in 1916. Khosta, attributed to the parochial settlement of Adler, had no temple. This caused immense amount of inconveniences for locals. At the beginning of the 20th century, at the initiative of the Government Justice Minister Nicholas II wife M. F. Shcheglovitova, P. Bulatova, N. Golubenko and others, the town committee was established for the purpose of church, school, and the instituting of an ambulance station. 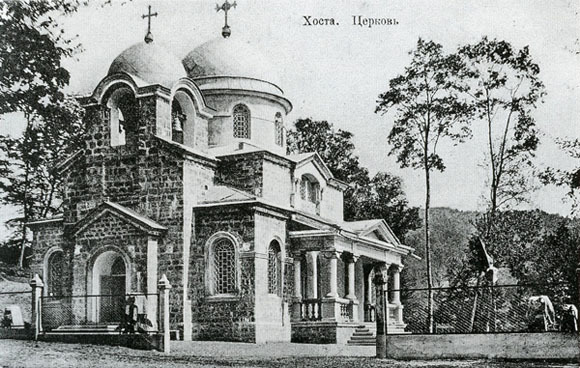 At the same time, the brotherhood of Adler Sacred and Troitsk monastery led by hieromonk Markian conceived to open a metochion in Khosta, having consecrated it for the sake of Saint Nikoloas of Myra in memory of the Emperor Nicholas I. However, revolutionary events of 1905-1906, financial difficulties, and confusion tightened implementation of these intentions. “Inhabitants of this settlement, due to the political distempers which were here in 1905 and in 1906, were forced to leave all their property, having left everything to the mercy of fate, and only now came back, needing, therefore not able to come to help the temple construction by personal means …” - the archbishop Kartalinsky, the exarch of Georgia Nikon, to the Lord Chamberlain of the Izvolsky Household. November, 1907. “To favor a local landowner, the spouse Minister of Justice Maria Shcheglovitova taking part in a construction of the commemorational church, to start collecting donations for needs of the new constructed temple”. Furthermore, on behalf of the Emperor Nicholas II the Synod transferred four thousand rubles for construction of the temple. The project, drafted by the Sochi architect, V.A. 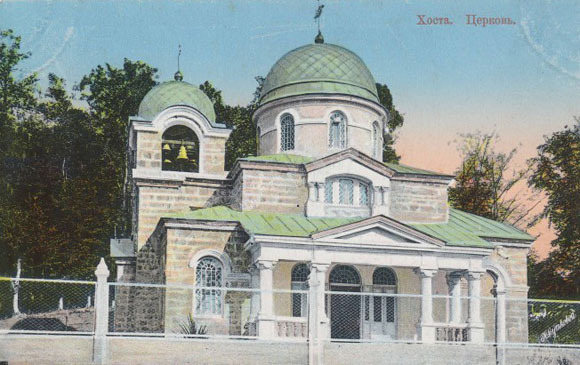 Ion, was recognized as the most accomplished - so in the first two decades of the 20th century the Lord's Transfiguration Temple in Khosta was raised under his plan. The Revolution of 1917 and the coming to power of the Bolsheviks, who were actively fighting against religion at first by means of promotion, and then later legislatively, and with use of repressive devices, played a fatal role in the destiny of the Khosta temple. In 1929, its community ceased to exist, and the church was closed. The authorities intended to use the building as a reading room and museum of local lore. However services in the temple proceeded two years longer thanks to the courage and resolution of the metropolitan of Nizhny Novgorod and Arzamas Evdokim (secular name Vasily Ivanovich Meshcherskiy), who was banished to Khosta by the renovated Synod. Through difficult years of Soviet atheism the church was saved by miracle. In 2000, the church was returned to believers and a restoration began that is in progress to this day. Today, the temple has these great shrines: icons with relics of Saint Peter, the Prince of the Apostles, as well as Saint Apostle Foma, Saint Tikhon, the Moscow patriarch, the great martyr George Victorious, Saint Matrona of Moscow, and the slipper of Saint Spyridon, Bishop of Trimythous. Thanks to Austin Waye for proofreading.